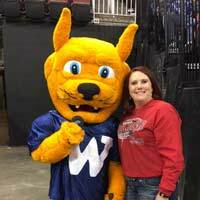 Webster's McConnell Air Force Base campus location sponsored the Wichita Thunder’s Go Red for Women night in partnership with the American Heart Association on Feb. 5. Webster University's McConnell Air Force Base campus in Wichita, Kansas were the proud sponsors of the Nov. 11, Wichita Thunder Veterans Day hockey game. Staff, faculty, students and alumni enjoyed a thrilling overtime shootout win by the Thunder.